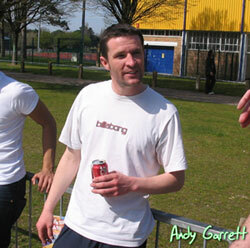 Andy joined the Flipside Team in December 2006 and has been tearing up the UK scene for a very long time. Andy's credentials speak for themself - he is a former UK Champion in Street (2 times) and Best Trick, he also placed 2nd in Best Trick at the World Championships in 2006 for a sick rodeo over a door gap and most recently tore ligaments in his hand at the 2007 UK Nationals trying a double backflip over the launch (!!!). He is known for going big on whatever he skates and throwing down huge rodeo's in every direction with the best of them, he's also an awesome guy to go party and have a laugh with, entertainment is never far away when Garrett is around!